They don’t make them anymore like they used to! Beautiful Royal Oak Day Date and moon phase in crisp conditions, 36mm in size, the perfect watch for the classic size lover! The case and bracelet are in crisp original conditions with prominent satin finish and sharp bevels. The bracelet sits on itself and is tight as new. One screw extra link appears to be darker in color and added later. The anthracite color waffled dial has no defects and features a Day, Date and moon phase sub registers. The crystal has a vertical scratch at 11 position visible at certain angles, it can be polished off. 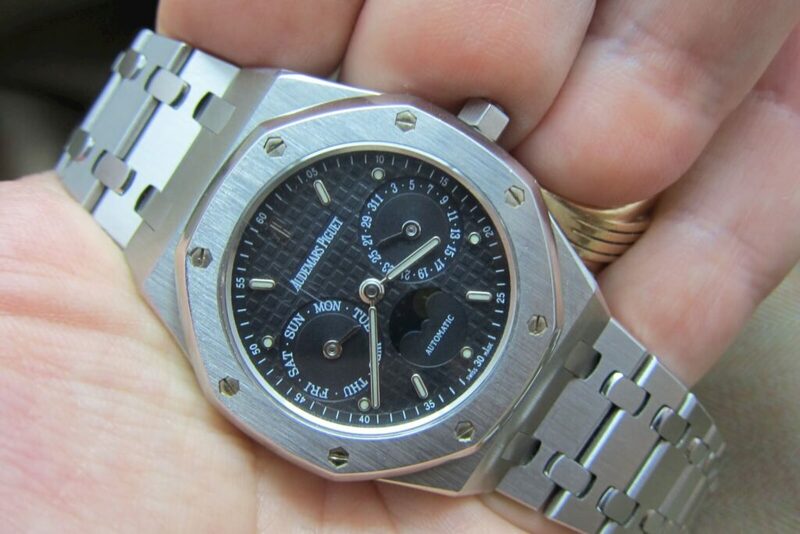 A fantastic watch for the Royal Oak 36mm lover!